I came across an interesting article on the BBC News website. 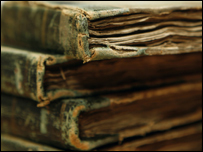 The UK is digitizing books that virtually no one has seen in maybe hundreds of years! This is incredible…. putting knowledge back in the hands of the people. This is our heritage and has the potential to be truly amazing. As a book person who can read a smattering of Middle and Old English I can’t wait to see some of these file! Heck even if I can’t manage to read them the artwork in the books will worth the time to look. More than 100,000 old books previously unavailable to the public will go online thanks to a mass digitisation programme at the British Library. The programme focuses on 19th Century books, many of which are unknown as few were reprinted after first editions. The library believes online access to the titles will help teachers. “If there are no modern editions teachers cannot use them for their courses,” said Dr Kristian Jensen, from the British Library. “What we can read now is predetermined by a long tradition of what has been considered great literature,” he added. At full production approximately 50,000 pages per working day will be scanned. Approximately 30 terabytes of storage will be required to accommodate the project’s output. The first 25 million pages are expected to take two years to complete. Texts which are hard to get hold of will particularly benefit from the digitisation. « Your law makers at work….